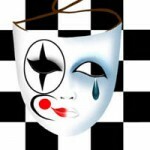 Unfortunately, dishonest people can be found in almost every social sphere, and unfortunately, the chess sport is no exception. Sadly it is not just because these people disgrace themselves and their families, but also because of their actions are affected by professionals who have dedicated their lives chess, chess and all sports. Quite unpleasant and even ashamed to admit that in the Crimea fraudsters who by blatant lies, shameless and vile blackmail threats over the years defraud honest and decent people money. And Crimean “Ostap Bender” not 20 or even 30 years. This is quite a mature man, which has a family and two daughters growing up female players. His name is Leonid Mukhtarov. Upon hearing the name, I’m sure, professional chess players are not open to anything new, because Mukhtarov already known for his “heroic efforts” in many countries. But here are new to chess, and their parents the article can be quite useful, and will protect against manipulation and fraud that person. The rapid growth of the Internet activity of the population has led to what is now on almost any person can learn just by asking his name and the name of the search engine Google or Yandex. A couple of years ago, has already published an article on Muhtarov that helped people do not become victims. How Leonid Mukhtarov is “working” ? It’s no secret that high-level athletes are often invited to the competition, while providing room and board and start. Leonid Mukhtarov, finding out or overheard players who intend to visit the big event, do the following: Contact the organizers of competitions, presented manager has offered to provide the athlete and his participation, if they Muhtarov pay a sum of money and provide free accommodation. For a long time, the focus has been successful until this fraud did not know the tournament organizers and the athletes themselves. 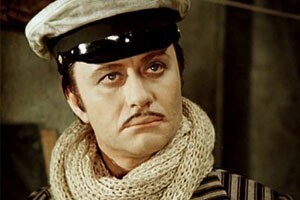 But Leonid Mukhtarov did not despair and invented a new method of fraud, enjoyed so far. Now his victims are unsuspecting parents of young players. 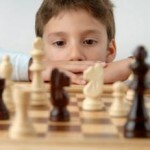 Giving your child a section of chess, they do not know the reputation of the person and the victims of his arrogance. Mukhtarov is a “professional” trainer (whom in any case is not! ), Praises the children and offers his services as a coach. If the competition is held outside ofUkraine, as the price he asks temporarily live with these people. If you have already found such a sacrifice and accommodation is provided, then asked to pay in cash. And that’s not all the tricks Leonid Mukhtarov. Leaving abroad, often represented Mukhtarov – Director Crimean chess club, kind of makes powerful man in the field, which in the summer in theCrimeaorganizes a lot of tournaments. In exchange for free accommodation at the moment, he promises to call the parents of young athletes at one of the tournaments, and they also provide free accommodation. 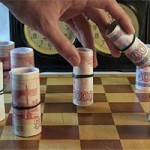 Of course, a tempting offer – summer, theCrimea, the sun, sea – and for this reason many people have been cheated. This trick was the occasion for disqualification Leonid Mukhtarov in famous tournaments like Moscow Open and AEROFLOT OPEN. This person has twice been disqualified from the Crimean Chess Federation. 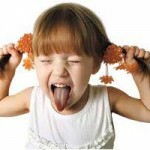 Disqualified him, and in some regions ofUkraine. 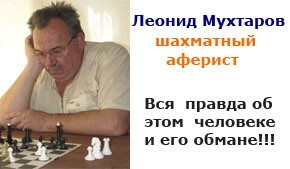 In the Federation constantly receiving complaints from parents Mukhtarov, coaches and staff chess school. It has repeatedly written complaint to the police, as was the case even physical abuse on the part of Mukhtarov. As mentioned above, Mukhtarov grow two daughters. They played chess and participate in competitions. But is not a champion ofUkraineor theCrimea. Of course every parent thinks their children’s talents, but there is still such a thing as sports principle. In accordance with it selected best children representing all ofUkraineandCrimeato high level competitions. Speculating children complaining blackmailing, threatening and insulting Leonid Mukhtarov just extort money from government officials, as well as city and national ministries. Intimidating and frayed nerves of all, he gets the money. While the current champions of theCrimeaandUkrainego to the competition at their own expense, his children go on the house, giving Daddy the opportunity to earn more! Not many athletes can afford to go to the European Championship 2009 inItaly. But Mukhtar fraudulently beg 3000 Euro from political party “Front zmin”(Yatseniuk) on a trip toItaly, where he took his daughter as much as the last place. But this money could pay for participation truly talented athletes who are adequately presented to theCrimeaandUkraineabroad. I do not set myself to condemn Mukhtarov, God will judge him. BUT! I firmly believe that a blind eye to his arrogant, ugly and inhuman behavior is no longer necessary. On his actions affected everything, including his daughters, who are the proper name. His infamy disgrace chess. Becomes just terribly, terribly hurt and frustrating when you go to the Ministry and hear what they say about chess players as people with a headache. Conclude this article appeal: If you had Mukhtarov, he deceived you, or trying to deceive even the others, not described above, write about it in the comments. Let parents and other players know about this man and what he can do to make it happen. After all, maybe it was his actions prevented a real talent to succeed and raise chess. Leave a link to an article at the page on social networks. The more people know about it, the less people will be able to deceive Mukhtarov. Он решил, что он король, ему все дозволено, но рано или поздно за любые поступки приходится платить! Время Мухтара пришло, пора платить по счетам! Такого наглого хама врущего в лицо вы вряд-ли где встретите, такой экспонат есть только в Крыму! Вот кого нужно показывать туристам! Я считаю, что от такого ярма необходимо избавиться. Пусть этот гениальный тренер на весь Мир покажет как необходимо тренировать детей на своих дочерях, которые без подсказок и маяков не могут выиграть ни одной партии. Я молчу уже о лени как тренироваться, так и привести себя в порядок. Нарушая все законы и морали живет на свете обыкновенная вонючка во всех смыслах этого слова, пытаясь изобразить из себя нечто, хотя на самом деле обыкновенное быдло, не умеющее ни писать грамотно, ни общаться с людьми. Остап был умным и изобретательным, а он предсказуемый и тупой! Статью надо было назвать “Вонючка 21 века”! Мухтар – человек, которому нельзя верить. Каждое услышенное слово он трактует как ему выгодно. Вообще он родился не в свое время. Такие кадры как Мухтаров были востребованы в 1937 году в качестве стукачей. За 2 года воспитания своих детей Леня достиг больших результатов. Вывозит своих детей только на турниры, в которых они могут получить приз хоть 5 копеек, садит им рейтинг, так как это слабые турниры и заставляет их все вынюхивать, и докладывать ему. Ранее тихо помалкивающие девочки только опускали глаза при его скандалах, а теперь активно включаются в воспитательный процесс тренеров, родителей и учащихся, объясняя, что им все должны и обязаны. Вопрос, когда они научатся говорить слова спасибо, не могли бы вы нам помочь. Последний вопиющий случай, когда этот округлившийся боров махал на тренеров ногами прямо в школе, требуя выйти на улицу тренера школы и нецензурной лексикой рассказывал, что он будет делать. Затем со своей женой орали на всю школу гадости всем попадающимся тренерам, родителям и их даже не останавливали взгляды испуганных детей. После всего этого они требуют, чтобы тренер которого он пытался избить занимался с его детьми. Так что к 2014 году ситуация не изменилась, а только ухудшилась. Радует, что дети растут и Лене осталось не долго мучать своим хамством и наглостью родителей, детей и тренеров школы. Люди, которые не умеют быть благодарными обречены на одинокую старость, презрение и неуважение. Мерзкий.другого слова не придумаешь.к счастью,не имела возможности быть им обманутой,но пару раз сидела рядом во время партии. Жирная противная свинья. Общение ужасное.если еще когда-то выпадет удача находиться в непосредственной близости с этим несчастьем,одену кулек на голову. Как же мне все это знакомо! Пришлось некоторое время с ним общаться. Вынужден был. Это ужасная семья! Леня хам, жирное быдло. Но у него еще есть жена Ирина. Та еще похлеще! Наглость и подлость этих людей не имеет предела. А меня Мухтаров угрожал утопить в Салгире, если я не соглашусь на ничью.